System Tray is a small window that consists icons of all apps of which you will get new notification and update. 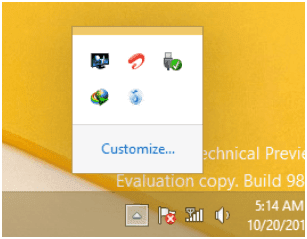 It is opened by clicking a upward arrow icon available on right side of task bar. Apps icons placed in System tray by default can be customized as per your wish to show, hide and receive notification. It will be customized by using following steps. -> At first, click on small upward directed arrow available at right side of Task bar to open System Tray. -> Drag icons from system tray to task bar. -> Again click on small upward arrow to open it and click on customize button. -> After that a window will appear which consist icons of all apps and its behavior. -> Clink on behavior of those apps to which you want to customize. -> Your can also chose Always show all icons and notifications on the task bar to display total icons and notifications. And If you want to go back default then choose Restore default icon behavior.